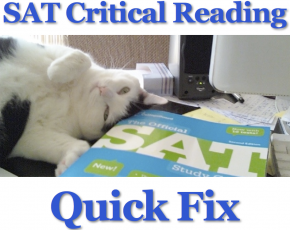 Have you thought about what it’s like to study for a super stressful, make or break test like the SAT from a student’s perspective? Imagine that you had to do karaoke in front of a room full of strangers. If you’re like most people, it’s a pretty scary thought. Especially if you think you’re a bad singer. Now what if you had to do it well? What if how well you sang a karaoke song was going to determine whether you got a promotion at work that you really wanted? What if you thought your husband or wife was going to love you less if you got up there on that stage and really stank? To make matters worse, imagine that you’re pretty sure you’re going to stink. You just know you can’t sing, because you’ve tried it a few times in the past and you’ve been horrible. That’s what it’s like for a lot of kids who have to take the SAT (and the ACT, and other tests to get into college). There’s a lot of pressure, and they think that they’re not going to get the score that they want or need. Why do they think that? They believe they have evidence, and they become convinced. After years of being in school, they just “know” that they aren’t good at math, or they don’t understand what they read, or they’re bad at standardized tests, or whatever. It’s the same way you’d “know” you won’t pass your karaoke test. Maybe someone laughed at you when you were a kid and you tried to sing. You’ve heard good singing, you know you don’t measure up, and you’re self conscious about it. It’s really hard to learn that way. If you can’t break out of those bad feelings, it’s almost impossible to reach your potential and do your best. If you had to do the karaoke test, you might try to practice a few times. Record yourself, listen to it. Compared to what you think you should sound like, it would be hard to recognize the small improvements you might make. It would probably get harder and harder to make yourself practice for that performance. Even if you had a singing teacher, it’s still embarrassing to stink in front of him. Why try hard if you’re not going to succeed anyway. It’ll hurt less that way. Then you begin to convince yourself that it’s stupid to make you sing karaoke in the first place. You might convince yourself that you don’t really want the promotion anyway, or that the love of your husband or wife wasn’t really that important. Before you know it, the day has almost arrived and you’ve hardly done anything or gotten anywhere. For a lot of kids, that’s the experience of studying for the SAT. That’s why, if you want a really big increase in your SAT score, you need to find a tutor or coach who can help you with more than just what’s on the test. I’ve been stressed lately about my score in Critical Reading. I got a score of 330 and I dont know how to improve it. I’ll be taking an exam on May and I want to get better. I don’t do well neither at sentence completion nor short/long passages. so I really need your help at this. Thank you. I can’t lie, that’s a really low score. I have a couple of questions for you. Is English your first language? Can you can understand the main idea of the passages when you read? You might have to spend some time getting better at understanding the type written English that you typically find in the SAT, before worrying about your SAT score. Take an official practice test without timing yourself, and see if you can answer half of the questions correctly. If you can, then you’re capable of getting a 500, which is a perfectly average score, and you should focus on being able to answer those 30 – 35 questions in the time allowed, leaving blank the questions you can’t answer. When you can get an average score, you’ll feel a lot more confident and you’ll be ready to work on getting an even higher one.